Upstart publisher Vault Comics hasn’t yet crossed the two-year milestone, but its eye for fresh talent like Natasha Alterici and Nick Robles and its upcoming fleet of titles from rising creators including Michael Moreci, Dan Watters and Alex Paknadel quickly put the family-run publisher on the map. On February 28th, Vault attempts a new feat: establishing a creator-owned shared universe of comics with Cult Classic: Return to Whisper from writer Eliot Rahal, artist Felipe Cunha, colorist Dee Cunniffe and letterer Taylor Esposito. Created by Rahal, the Cult Classic line will invite a range of creators to spin original sci-fi/horror stories linked by the fictional town of Whisper (think Stephen King’s iconic fictional towns Castle Rock and Derry, but with a ‘90s-nostalgia slant) and we’ve got the full list of Return to Whisper back-up contributors—as well as an exclusive short story to introduce readers to the Cult Classic world ahead of the first issue’s final order cutoff this Friday. The roster of Return to Whisper guest creators is a mix of familiar Vault names and new finds: Jackson Lanzing, Collin Kelly, John Bivens, Leah Williams, Katy Rex, Grace Thomas, Jenna Cha, Tim Daniel, Alejandro Aragon and Marissa Louise. Short story “New Bike,” which appears in its entirety below, is written by David M. Booher and Vault co-founder Adrian Wassel, illustrated by Nathan Gooden, colored by Stelladía and lettered by Deron Bennett. 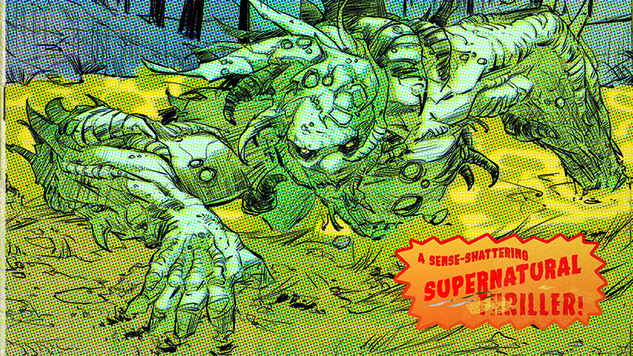 We’ve also got a first look at Alejandro Aragon and Marissa Louise’s “cover” for “The Sludge,” a Return to Whisper back-up story that pays homage to Len Wein and Bernie Wrightson’s horror-comic heyday.